Thankfully, Dr. Sean Bannan and our team here at Water’s Edge Dental are here to help! We want you to achieve the beautiful, bright smile you deserve, and with Zoom! Teeth Whitening, we can create incredible results in an ideal timeframe, boosting your self-confidence in the process. Do you have a big event coming up that you’d like to look your very best for? Does your busy schedule make speedy treatment a necessity? In-office Zoom! whitening can meet your needs quickly and effectively. In just one single, hour-long appointment at our South Daytona dental office, we can brighten your smile by several shades and create the beautiful transformation you’ve been dreaming of almost instantaneously. You’ll be able to leave our office with a set of teeth you’ll be proud to show off to the world! 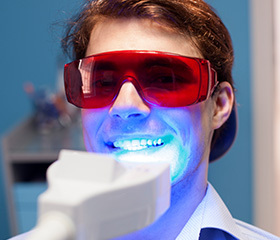 Of course, in-office teeth whitening may not work for everyone. Some patients are concerned about sensitivity, and others want to ease into their new look at a more gradual pace so that the changes aren’t too jarring for those around them. At Water’s Edge Dental, Dr. Bannan strives to provide our patients with dental care that meets their needs and leaves them feeling content, and cosmetic care is no exception. That’s why he offers take-home teeth whitening kits as an alternate option. These customized oral appliances are simple to use – all you do is fill them with the provided high-grade gel and wear them for a predetermined amount of time each day. They can accommodate your schedule, and you can brighten your smile in the comfort of your own home. Some patients even see changes after the very first use, while the most dramatic results occur after a few weeks. At Water’s Edge Dental, we don’t want to just improve the health and beauty of your smile – we want to benefit your overall wellbeing with our care! Contact our South Daytona, FL office today to schedule an appointment. We also welcome patients from the areas of Daytona Beach, Ormond Beach, Holly Hill, Port Orange, Edgewater, and beyond.